Herbs and spices (either freshly grown or dried ones) have been around for centuries and they are the main ingredients to pep up the flavors and aromas in our daily cuisine. 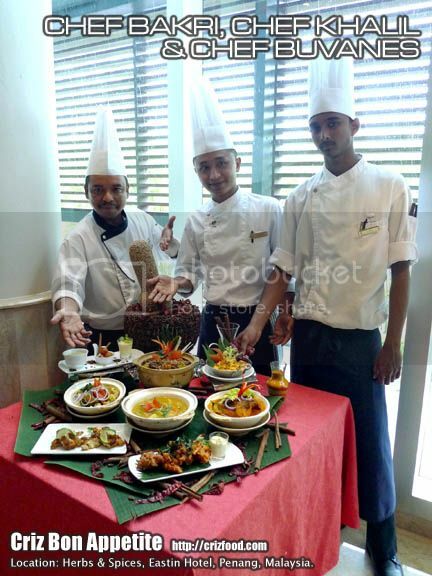 For the month of November 2013 (1-30 November 2013), the Swez Brasserie @ Eastin Hotel, Penang, would be having its Herbs & Spices Promotion to send your taste bud tingling back to the days of the Maharajah. This promotion would be under the skillful hands of Chef Khalil bin Khazali, Chef de Partie (Malay Kitchen) and Chef Buvanessuaran a/l Muniandy, Commis 1 (Pastry Kitchen), supervised by Chef Mohamad Bakri, head of Malay Kitchen. We started off the meal with a soup called Chicken Mulligatawny Soup (印度香料雞湯). Mulligatawny is a traditional curry soup of Indian origin but it has many variations depending of which region it came from. The soup basically has the ingredients of your common Potato & Carrot Soup (ABC Soup as some locals may call it) but slightly spiced up with some curry powder, plus added green apple slices for some extra crunch and sweetness. This soup would normally be thickened up with some rice grains but there would also be the option to apply in some heavy cream. The mild spiciness of this soup would suit Westerners more. 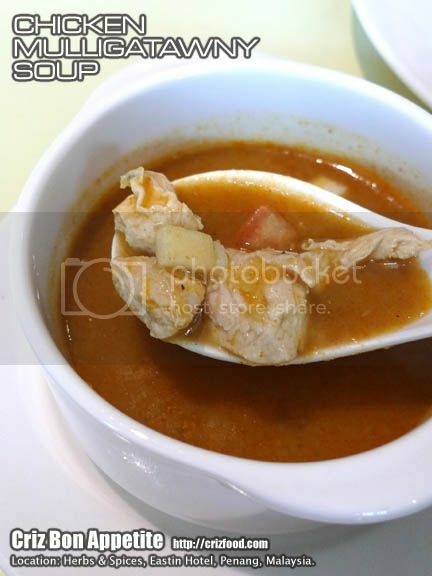 However, being a spicy lover, I personally find the soup to be a bit too mild and watery to my liking. On top of that, being towards a more Indian theme, it lacked the common garnishing of herbs such as cilantro and/or red chilies to bring out more depth in the dish, taste and flavor wise. 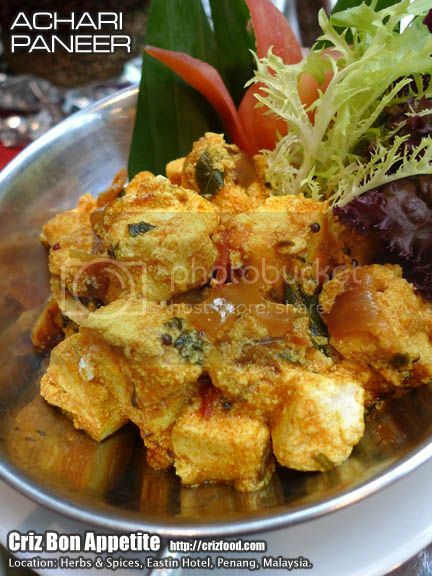 Next we had a dish known as Achari Paneer (鮮辣芝士沙拉). Paneer is a kind of non-melting Indian style cottage cheese, processed by separating the curd from the whey by adding some food acid into hot boiling milk. The drained curd would then be soaked in chilled water for a period of time to get the almost bean curd hard like texture. This “either you like it or not” type of non-melting paneer is extremely versatile for any form of cooking, even as a pakora. The kitchen did it in a spicy way by stir frying those cubed paneer with a long list of herbs and spices. The aromatic accompaniment was nicely prepared with the right balance of flavors. However, I noticed that the paneer was not properly drained as there were still some traces of moisture oozing out from cooked cheese. The kitchen might pull through by preparing the dish this way but it would be a bit risky if they planned to deep fry those cubed cheese. Since I’m quite fond on Indian finger food such as the vadai, masala vadai, samosa and more, I find the next item to be simple and yet fulfilling. We had Deep Fried Pakoras (香酥炸蔬菜). 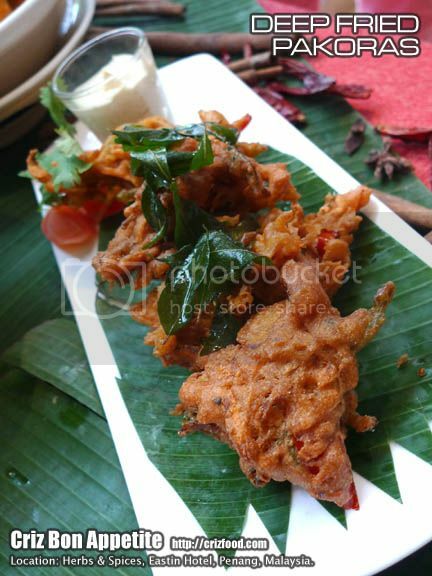 Each pakora had some finely cut onions, chilies and spices mixed in gram flour prior to being mold into bite size for deep frying. These lovely crispy snacks went well with their Madras Curry Mayo dipping sauce. The Chicken Tikka Masala (馬薩拉香濃雞) was lovely. 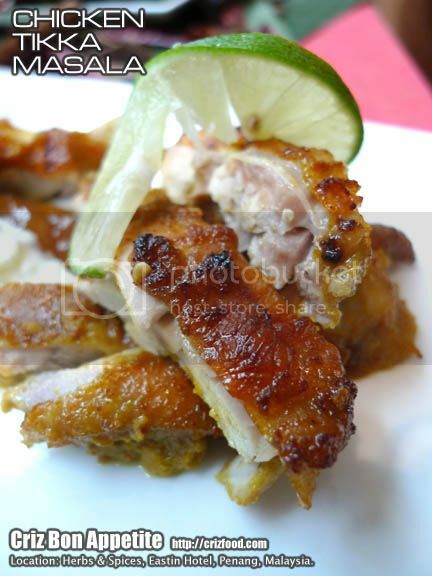 The meat was well marinated and tender with a high presence of garam masala usages. If you can get hold of a slice of lime, a little squeeze would pep up the flavors even more. Thumbs up! The Goan Fish Curry (印度傳統咖哩魚) was served next. 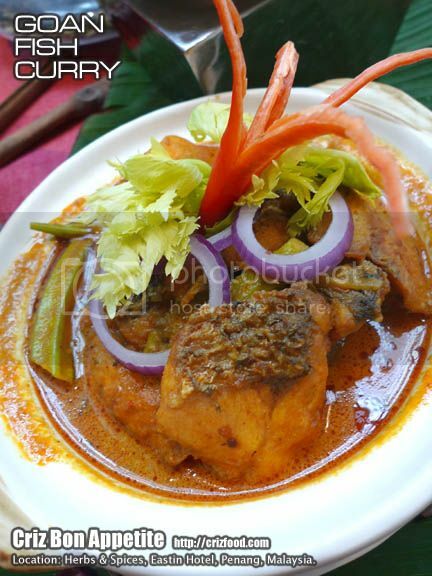 The Goa style curry fish was normal. You practically get this style of cooking anywhere in Malaysia, whether they are from a Malay, Indian, Indian Muslim or even a Chinese economy rice stall. On the other hand, the Sindhi Kadhi (咖哩蔬菜鍋) was also another common dish served. This nutritious dish with a predominant use of various vegetables, complement each other beautifully in terms of color, taste and texture. We were also served with the Masala Aloo (香濃馬鈴薯咖哩). I was wondering if the kitchen named this dish wrongly as there were no “murgh” aka chicken in the dish. Thus, I had renamed it as Masala Aloo rather than Murgh Aloo Masala. 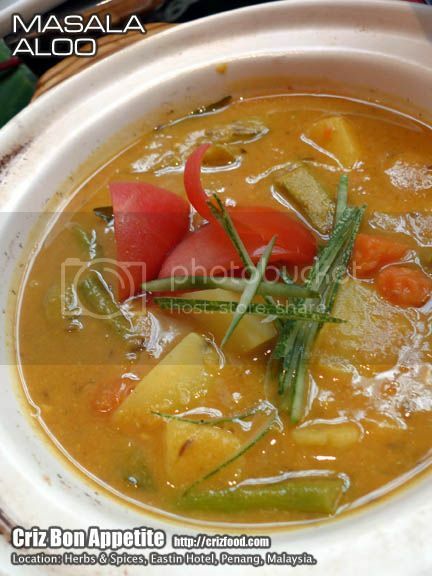 The dish practically tasted almost like the Indian style Dhal Curry. However, instead of using lentils, these were replaced with chickpeas. 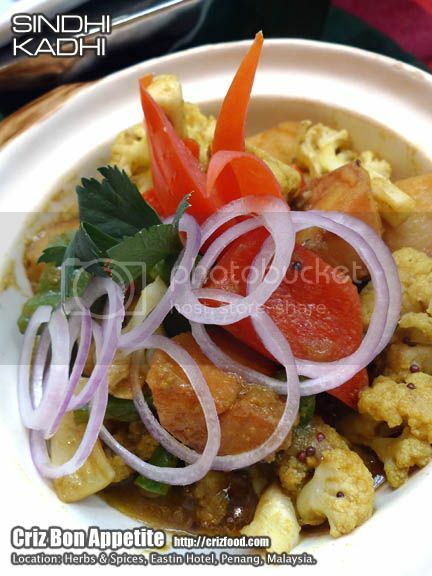 This dish would go well with rice or any of the Indian bread, especially roti pratha and chapati. 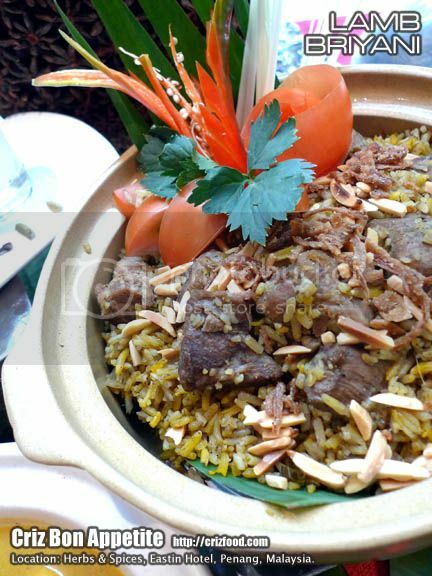 Lastly, there was also the Lamb Briyani (羊肉燜飯). I kind of like the tender and well marinated lamb pieces here. However, the rice somehow lacked the fragrance and texture I was expecting. Though Basmati rice grains were used, the amount of water used was not enough to ascertain the ideal al dente of the rice. The rice was rather dry and lacked of flavors to my liking. There would always be some sweet desserts for last to complete the contentment. Well, it’s almost always true but not as sweet as the Indian desserts. 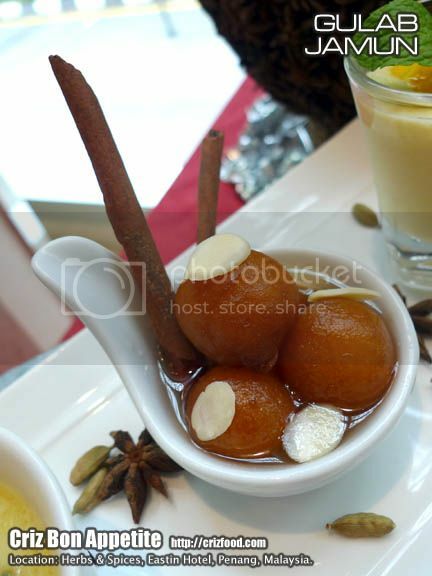 Though the kitchen had cut down on the sugar usage, I still find the Gulab Jamun (玫瑰黃金球) to be over excessive in sweetness. The deep fried dough basically consisted of flour, milk powder and baking soda and soaked in a pool of rose infused syrup. Somehow, the syrup lacked some significant flavors such as those from rose and notably cardamoms. 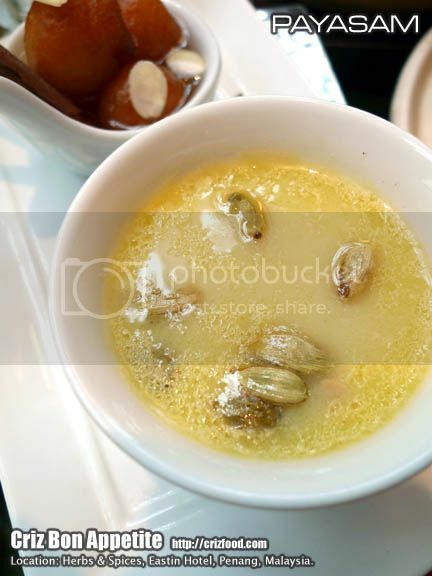 There was also the Payasam (香料西米露) which was made up of super sweetened milk with a high usage of cardamoms with a light garnishing of fried cashew nuts. I could not ascertain the starch used as it could be either semiya, a type of vermicelli or even poha, a flattened rice, as the dessert was to0 sweet for my consumption. 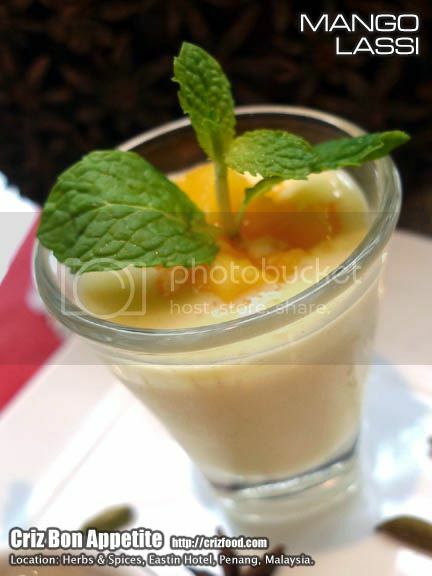 Last but not least, we had my favorite of the day – Mango Lassi (芒果拉西). This barely 100 calories yoghurt and milk based refreshing beverage was well chilled with added chunks of fresh Indian mangoes. It was great to slurp down the lassi after a heavy meal of herbs and spices infused cuisine. Overall, I find that the theme for this month was rather confusing as all the dishes served here were of Indian cuisine. It was not wrong altogether as the Indians do use the most herbs and spices in their daily cooking. 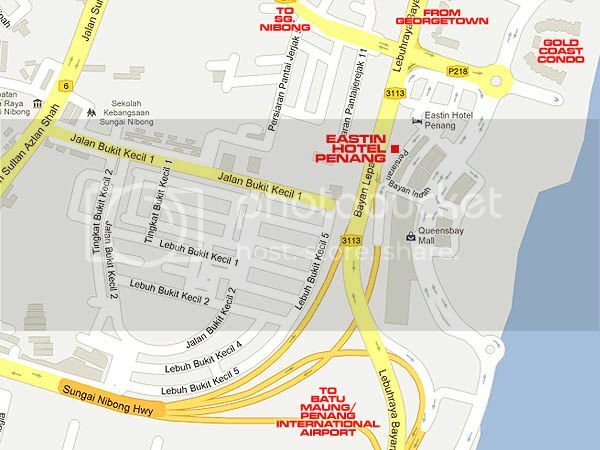 However, I personally feel that diners would want more options of other origins such as Thai, Malay, Vietnamese, Nyonya and so on. I was really expecting some Nasi Ulam which is a dish that’s rather unique in this region as most countries won’t be able to acquire most of the herbs and spices from Malaysia. Even some local Nyonya dishes such as the Perut Ikan and Otak Otak would have impressed most of the foreign diners. On top of that, what about some simple herbs and spices usage Western cuisine? I do hope the kitchen would have a wider range of options for this promotion by coming out with more authentic flavored dishes rather than sticking to solely Indian cuisine. Moreover, there are the Northern and Southern Indian cuisine too with different flavors. Here’s the summary of the Herbs & Spices Promotion.